A cold & frosty week of fun! This past week the temperatures have dropped considerably in N.I, most mornings it was -2c when I was arriving at school and it didn't get higher than 4c during the day. The heavy frost that was on the ground stayed all day & it there was so much ice to be found around the playground. Of course some children feel the cold more than others plus some aren't dressed appropriately for the cold weather. I have talked this over with colleagues who run outdoor preschools & we all agree that some parents should be made to stand in the playground for an hour for them to appreciate how cold it can be! We have a supply of extra coats, fleeces, hats & gloves and some children will even need an extra pair of trousers to keep warm. On days like this we generally stay out for 40 minutes, then go inside and come back out after lunch when it is a little warmer & the children are warmer after being inside for a couple of hours. 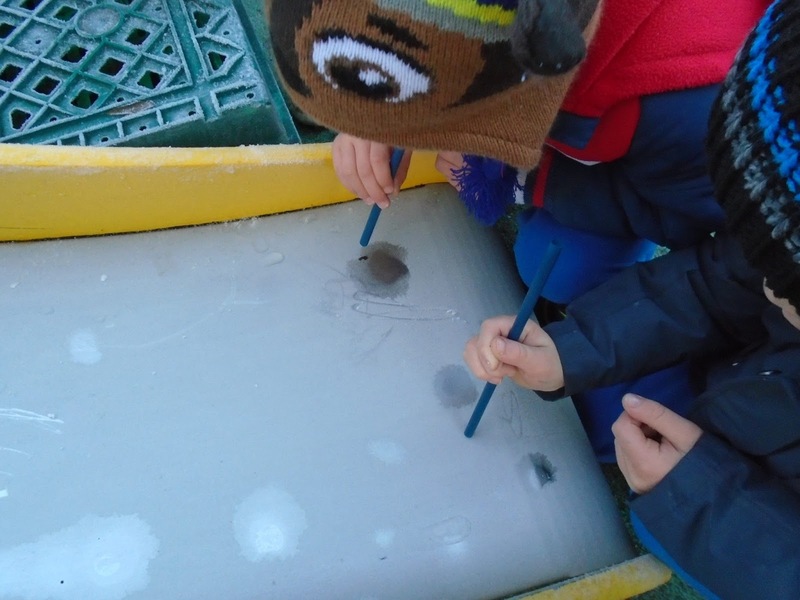 We brought out some straws and the children had fun blowing down them to melt the frost. 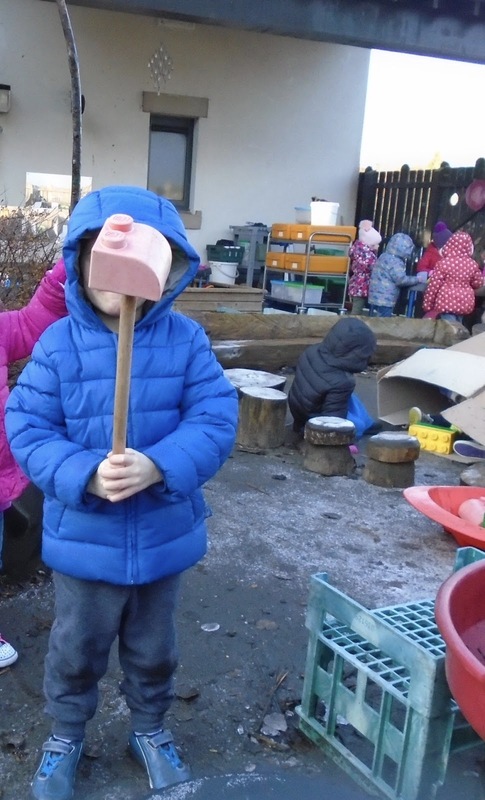 Luckily on Tuesday when we had a trip to one of our partner schools to play in their amazing outdoor space, the temperatures rose a little and the children had so much exploring this great site & some even discarded their gloves and hats after running about for an hour or two. A beautiful sunset over the nursery on Monday evening. We have two days a week where we stay outside until lunchtime - Tuesdays & Thursdays. This week it was just so cold on Thursday that I knew we'd have to get the children warmed up again before venturing up to our wooded area known as Bear Woods. So after playing outside for 40 minutes we gathered all the children in the cosy story room & got them ready for going back outside again - the children wear waterproofs when visiting Bear Woods & we made sure everyone had gloves & a hat. The path up to Bear Woods was very slippery but even when some children slipped over, they just laughed and got back up again. They had some snack in Bear Woods - it turns out they really like brioche! Then after lots of running about & sliding down the frost slope, we set off on a big adventure - to explore the much bigger wooded area in the main school grounds - Big Bear Woods! The children loved clambering about in this space & roaming along the paths. This area is open onto the main playground but we put some rope across part of the area & told the children to stay behind the rope & they did. Exploring 'Big Bear Woods' in the frost. This is definitely an area we will revisit as the children liked having all the space to explore. The Friday was as cold as the Monday had been so we stayed outside for 40 minutes & had some hot chocolate to warm us al up before venturing indoors for a few hours. Then after lunch the children were all ready to go out again & had fun finding a large piece of ice that they tried to stand on without slipping. One child put a lego brick on a stick & gathered some other sticks to make a fire to toast it on! I have to admit I do like cold, dry weather the best and the frost made everything look so pretty. I have just returned from a week in Iceland as part of the #educationiceland group organised by Martin Besford of Highway Farm Activity Centre in Cornwall & Unnur Henrys of Stekkjarás Leikskóli, Hafnarfjordur, Iceland. The original idea behind this visit was to bring a group of educators from the Cornwall area over to Iceland to begin to make links with schools between the 2 areas - however in the end there were people from outside Cornwall too. Martin & Unnur met up for the first time 3 years ago when Martin & I were part of another group that visited Iceland - #playiceland - organised by Hulda & Tom of Fafu. I had become friends with Unnur through social media & knew I had to visit her school when I got the opportunity to go to Iceland, luckily her school was willing to have 2 groups visit over the 2 days we were looking around schools. Martin & Unnur became firm friends & their respective schools have become partners & have visited each others settings frequently in the past 3 years. So, when these two said they were organising week long visit & a conference and asked me to come along and do a workshop at it, I jumped at the chance to firstly get another chance to spend time in Unnur's school but secondly to meet up again with people who have become firm friends in the past 3 years - Martin, Unnur & Lesley from Takoma Park Cooperative Nursery School. 3 years ago what I noticed was that Unnur was an extremely enthusiastic educator who was passionate about getting her class outdoors & using the amazing forest area that was right on the school's doorstep. The biggest question most of us had was how she managed to take 2 year olds out into such a vast space, as the classes were mixed aged groups with children ranging from 2 - 5 in every class. Unnur & I had connected when she had seen some photos of my class outdoors and we had begun to chat on line about the various ways we could convince our colleagues to embrace the outdoors too. 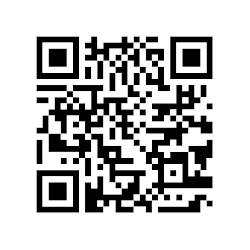 This time round I could see that Unnur is much more confident in her practice and is very much an expert in this field - I could see that other colleagues looked to her for advice or ideas on how to enhance their outdoor experiences. By going twice a week every week with her classes, Unnur has become so much more confident in all that she does in the space, it is now very much 'their' space, the children are very familiar with it, as some of them have being going there for 3 years & the staff aren't afraid to take resources with them to use in the space - or take fallen trees back to use in the school. This space & the way this preschool uses it is unique to them & this beautiful wild setting - they could have tried to replicate things they had seen online or in other countries but instead by visiting other settings & countries, the staff are all confident to know what will work for them & what won't. But of me the biggest message is that the staff were allowed the time to explore the space and to decide on an ethos that suited them, they don't have the pressure from above to comply to certain whims that are seen to be the latest 'must have' in education. 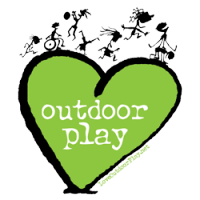 More and more staff members are making use of the wonderful outdoor space because they can see the benefits, the children are happier & there are plenty of little natural decorations around the school that they have brought back with them over the past few years. The teachers in this school have embraced every opportunity to widen their perspective and especially Unnur, who has visited lots of settings across the UK and further a field to help sustain her enthusiasm and embed her wonderful outdoor practice into her every day teaching. It was wonderful to see her lead a maths lesson out in the forest and to see how every opportunity of training has been harnessed by her and brought back to be used in her own setting. Unnur a passionate & enthusiastic educator. For those us from the UK & US who were spending time at the school, the biggest questions featured around paper work & risk management. The teachers from Scotland & England were amazed that their colleagues in Iceland don't have endless reams of paper work to fill out before they can take classes off site & they don't have the same pressure to capture data to prove that the children in their classes are learning - parents and school boards are confident that the teachers are working hard each day to ensure progression in learning & they TRUST the teachers to get on with jobs without constant observations and lots of paper work to prove it. I only wish Iceland & Ireland were nearer so I could visit Unnur's school more often & that our classes could meet up - my class were so delighted to see my photos from my visit but also very disappointed that they can't go & meet the children too!